ERE's service for monitoring network security and compliance is by far the most comprehensive, granularly tunable, and effective service available to any enterprise. 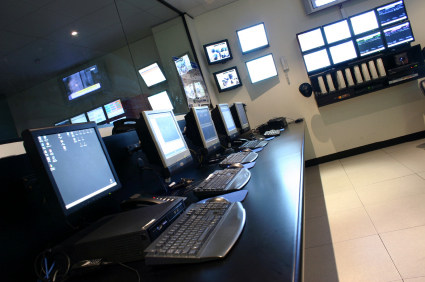 Through continuous monitoring of network devices and critical assets, events are collected, filtered, correlated against time and against all other monitored devices. False positives are eliminated in real time. 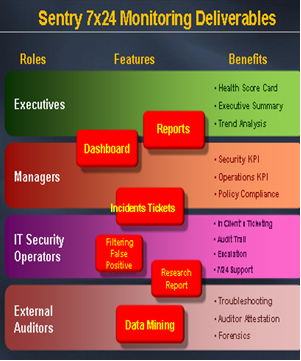 We evaluate hundreds of thousands of monthly security log events and other log analyzer events for each client and reduce them to handfuls of clear, actionable trouble tickets. No agents to be installed on a client's network. Our 7 24 IT security monitoring service which includes our 7 24 IT security auditing service has agents only on one data collector device for which the client has complete control. 100% passive service. Our 7/24 IT security auditing service has no ability whatsoever to affect a client's network. Granular custom reporting and tuning that client IT operations team requests, ongoing. Respond to client questions / requests 7/24. Analyze complexities to identify meaningful incidents prior to sending our trouble tickets. Active directory : stale accounts : HR changes. Active directory : WSUS: patching system. We launch MBSA : active directory : corporate policy control points. Any other collection of fields a client requests we correlate and alert / report. For our clients who do not wish to manage their own network IDS and HIDS, we provide for those technologies 24x7 Managed Security Service. Network security monitoring and monitoring security logs should deliver clear, actionable reports; not huge amounts of analysis. Let ERE do all the back end analysis, triage, first level testing and get the job done. Contact us now save you time cost effectively with our 24x7 IT security monitoring and 24x7 IT security auditing services.